As I continue my dive into London life, I am trying to get myself a job. I am currently speaking to two different companies, and this week had two interviews planned with those companies. However, over the past week and a half, these interviews have been scheduled, rescheduled, alternative times proposed, alternative times rejected, times and dates shifted, revised, modified, adjusted and tweaked. As time has passed, the two interviews ended up at various times being on every day this week except Wednesday. All the changing times and dates does make it a little hard to plan things to do. Finally as dates and times shifted towards later in the week, it looked like leisure time has started to open up for me. I woke up on Tuesday and hadn’t heard anything regarding any changes on my interview dates, at this point one scheduled for later in the week and another for next week, so I decided on the spur of the moment to go to Stonehenge. Alright, it wasn’t exactly spur of the moment. It’s not like I’d never heard of Stonehenge or hadn’t planned to go there. I had, and had already figured out how to get there. It’s just that I hadn’t picked a specific date to go. A sunny Tuesday seemed like an excellent time, so I headed down to Waterloo station to catch the train to Salisbury. 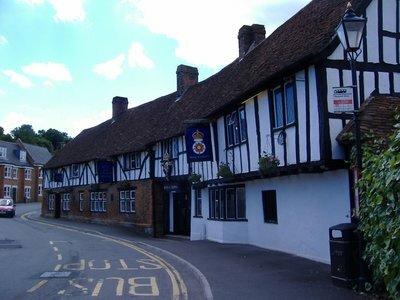 Salisbury is a Medieval town dating back to the 13th Century. 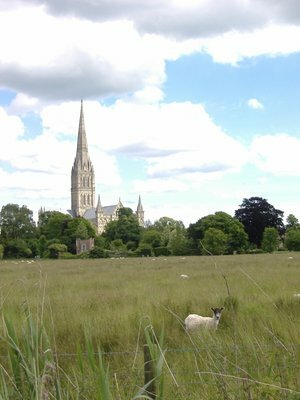 It is best known for two things (other than being the nearest train station to Stonehenge), and those two things are the Cathedral and sheep. The Cathedral is massive, and has the third highest spire in all of Europe, bested only by St. Peter’s in Rome and Cologne’s Cathedral in Germany. The tourist information on the Cathedral stated that the Cathedral is the tallest spire made during the Medieval period, as the other two churches were started but not completed during the Medieval period. Sounds like splitting hairs to me, but when it comes to tourist boards claiming biggest, longest, highest, deepest, oldest or any other “est,” it seems they will split as many hairs as needed until they can claim being the “est-iest” of all the tourist attractions. After all, it doesn’t do much to bring in the crowds to say that you are the “taller” of all the Medieval Cathedrals. The Cathedral holds one of only four of the original copies of the Magna Carta, which I wanted to see. However, there was a “flower show” in the Cathedral courtyard, and the only way to see the Magna Carta was to pay admission to show at £8. Forget it, I said. I live here now, I can come back again at some point, now I know how to get here. Salisbury took on another industry during the second world war, being one of the places where the Spitfire airplane was being built. Despite this, and the nearby armed forces training grounds, Salisbury didn’t get bombed during the blitz, and they can thank God for that. Or rather, they can thank those who wanted to celebrate his glory and built the tall cathedral. The German Luftwaffe were under strict orders not to bomb Salisbury to ensure that the church was not damaged. This was not because of some religious concern though, but rather because the tall spire made an excellent landmark when flying from across the channel. From Salisbury, the pilots could then follow the various rivers to their targets. 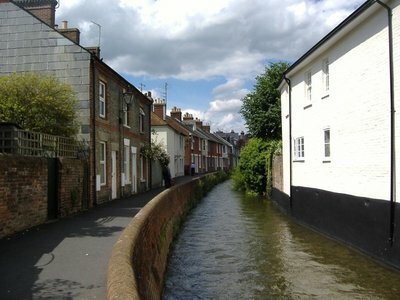 Pilots would have a number of choices for following rivers out of Salisbury, as the city was founded on the confluence of five different rivers, including the River Avon. 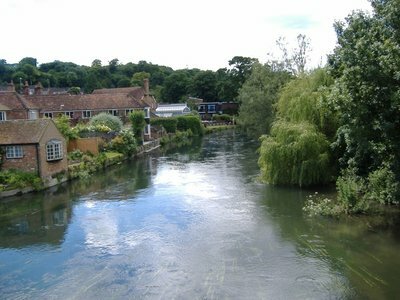 Note that this is not the same Avon that Shakespeare used to look out upon from his house in Stratford. Just to ensure that things are extra confusing, there are four Avon rivers in England (and more in Scotland and Wales). Not only that, but the word Avon s derived from the Celtic word meaning "river", and therefore the river's name means River River. Thinking about all those different Avon Rivers confused me so much, I had to stop and have a cider on the banks of this specific Avon just to clear my head. 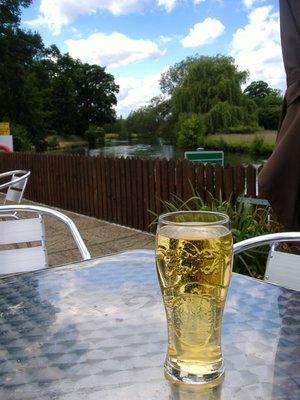 Luckily, the Rose and Crown Inn had a nice patio facing out onto the river, so I grabbed myself a glass of Strongbow from the Avon Bar, and let the cider cool me down as the bright sun warmed me up. 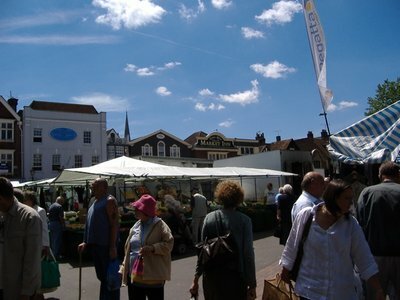 Salisbury is a Medieval town, dating back to the early 1200s. 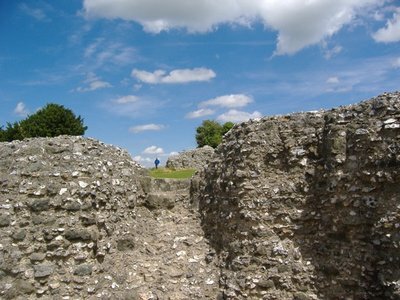 The Bishop wanted to relocate his Cathedral away from its present location at the nearby Old Sarum castle (more on that later), and so he set up a market town down in the valley near the rivers. I was lucky to arrive on market day. There are only two markets a week, and I didn’t plan or anything, so sometimes serendipity works out in my favour. 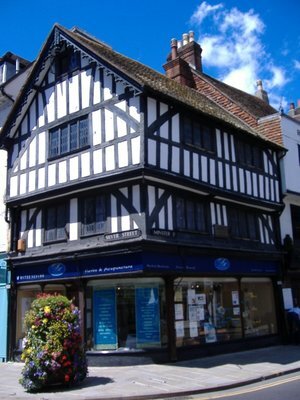 Some of the buildings have been restored to their original look, including this one which dates back to the 13th century and was restored using historic methods, which means no nails in the house, just some well fitted beams. 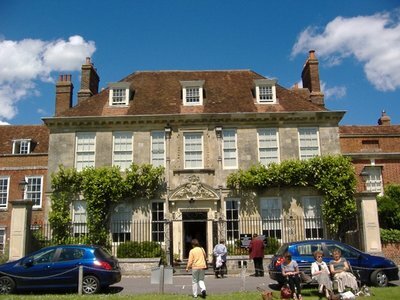 One of the other things that folks might know from Salisbury is Mompesson house, a beautiful Queen Anne Architecture. The house was built in 1701 for Charles Mompesson, a local Member of Parliament. It was in the movie Sense and Sensibility staring Emma Thompson and directed by Ang Lee. It was a good movie, which most Ang Lee movies are, assuming they don’t have giant green hulks in them. 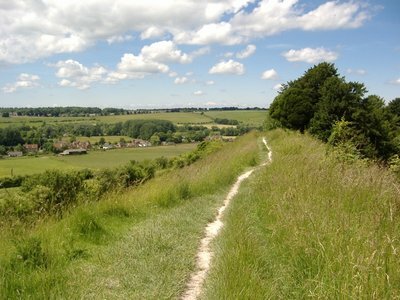 Just up the hill from Salisbury is Old Sarum. 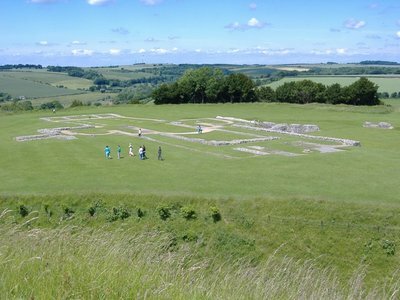 Old Sarum, atop a high hill, was both an important religious and political sight dating back to the iron age. 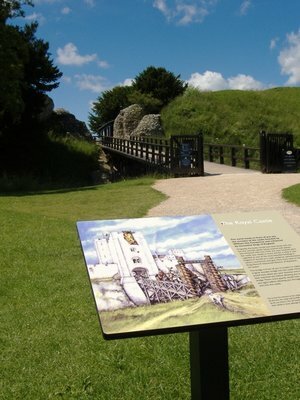 It was occupied at various times by Romans and Saxons, but it gained its greatest glory as a Norman castle, and was the sight of William the Conqueror’s first national congress, where various lords and knights came to pay him homage in 1086. The castle grew, and beside it a large cathedral. 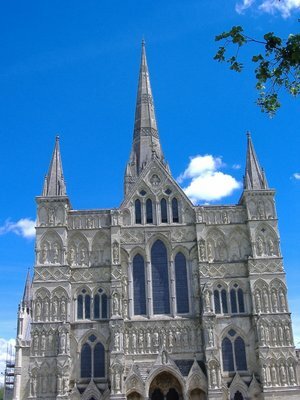 Things were good for a while, but eventually the tension between the castle and the cathedral grew, which eventually led to Bishop Poore moving the Cathedral to its current sight in Salisbury. After the movement of the cathedral and settlement of the new town, the castle and surrounding homes soon became deserted. By the 17th Century, Old Serum was deserted, but even so it still held two seats in the House of Commons. It was one of the most notorious of the “rotten boroughs” that eventually led to the Reform Act of 1832. ...and wound up walking all the way around the sight along this white path. It actually ended up being a nice little walk, and gave me some excellent views of the English countryside. Up the road from Salisbury, just a couple miles from Amesbury is Stonehenge. 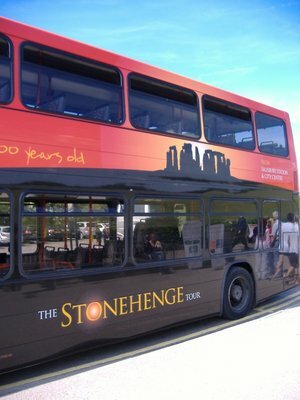 I grabbed the Stonehenge Tour Bus from Salisbury train station, which does a big circle from Salisbury up past Old Sarum, to Stonehenge and back again. The Stonehenge sight has been important for thousands of years, with the first structure on the sight dating back to 3000 years before the birth of Christ. This was an earthen structure with some wooden bits. About a thousand years later, somebody decided to build something really impressive out of stones from Wales. 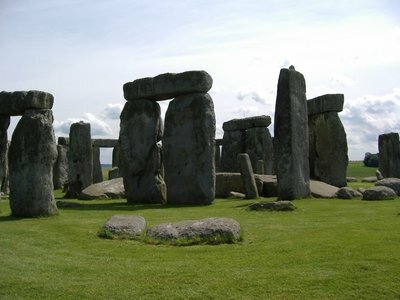 They quarried 82 stones in Wales, floated and dragged them 240 miles to the sight, and then set them up in a big circle. But that wasn’t enough. 150 years after that, someone said, “more stones!” So they wandered about 25 miles away, picked up a few 50 tonne stones, and dragged them over the hills and through the dales to put up another circle. The big stone structure does act, apparently, as something of a solar calendar. 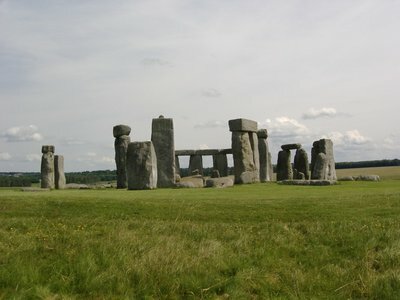 The Summer Solstice is just around the corner (June 20th), the place will be abuzz with folks watching the sun rise between two of the sarsen stones, rising just above the line that runs between the heel stone outside the structure and altar stone in the middle of the circle. Last year, 24,000 people showed up to see clouds. Perhaps with some luck the weather will hold for them. Personally, I’m staying away. It was crowded enough today for me. So that’s that. I really wanted to be more interesting and mystical about Stonehenge, but I found it a little underwhelming, really. I mean, it is impressive that the place was built so long ago, and I appreciate how that would have been hard for them, but it is just a bunch of stones in a circle. Luckily for me, though, I actually did everything you read in this blog in reverse order. So for me, I went from underwhelmed at Stonehenge to somewhat impressed at least by the beautiful views at Old Sarum to being genuinely pleased by the nice town of Salisbury, eating a really excellent pork sandwich at the market, wandering by the beautiful Cathedral and other medieval buildings and ending the day sitting on the Avon with a pint of cider. Not a bad way to end a day, even if someone isn’t going to build a monument to it that will last 5,000 years. Well done, very humorous . Good luck on the job front. 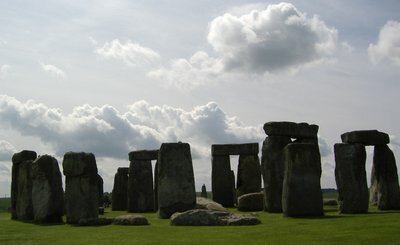 I visited Stonehege a few years ago, right around the time that England was embroiled in an outbreak of mad cow disease. I took a tour from London, and by the time I boarded the bus the only seat remaining was among a visiting rugby team from Michigan. I fit right in needless to say! When we arrived in the parking lot, the rugby team members decided to don these white coveralls, similar to the paper like suits we used to wear at Western as part of the purple spur to cheer on the Mustangs. As they approached the front gate, the staff broke into a frenzy thinking that the young men were from the department of agriculture coming to shut them down due to the outbreak. The confusion that ensued was reminiscent of a Faulty Towers episode, and far more memorable for me than the structure itself!! The cider on the Avon sounds lovely though! 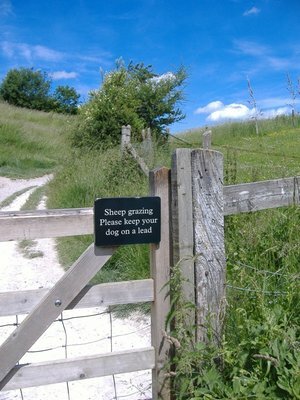 Hehe, totally agree - can I count on your support next time I point out the underwhelmingness of stonehenge? Salisbury is a very nice town, and I like how highly you rated the pork sandwich and cider by the Avon. Did an 18" Stonehenge monolith get lowered onto the stage and...oh, wait, wrong movie. Looks like you're settling in beautifully! Good luck on the work front--sounds like you need lots of patience. So have anymore HR people jumped out from hedgerows at you recently Greg? Great read as usual!